Replace PORT with either 1234 for non-SSL, or +12345 for SSL. 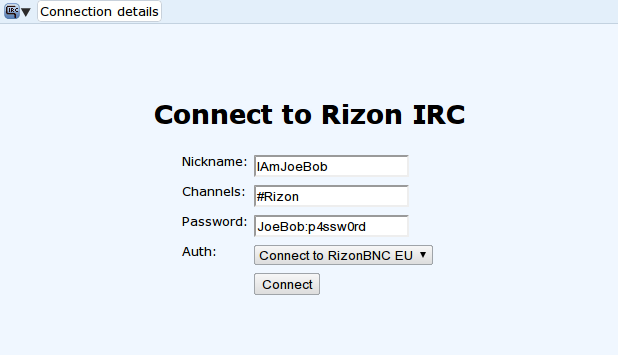 Enter rizonbnc.us.rizon.net:1234 into the 'Server address' field. 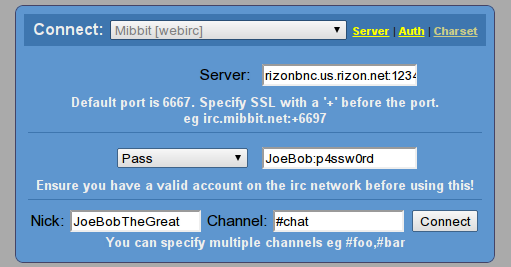 For SSL: Change step 3 to rizonbnc.us.rizon.net:+12345 as the address. If you don't know what SSL is, then use the normal address. In the text bar below, type /server rizonbnc.us.rizon.net:1234 user:pass, and hit Enter. For SSL: Change step 4 to /sslserver rizonbnc.us.rizon.net:12345 user:pass.